In 2003, Sandra Millers Younger was living in her dream house in the country near San Diego. In just moments, her dream was shattered when, in the blink of an eye, they lost their home, 12 neighbors and nearly their own lives from a catastrophic wildfire. They drove through darkness, smoke and flames to escape. For the next two years, the family focused on rebuilding their home and reinventing their lives. Through that process, Sandra discovered a new calling and career as an author, speaker, storyteller and resilience mentor. It took Sandra 10 years to write her book, The Fire Outside My Window: A Survivor Tells the True Story of California’s Epic Cedar Fire. The book has been praised by readers and adopted as a training text by top-level emergency professionals. During her research, seeing those affected by the fire self select as either victims or survivors, she realized we can choose our story moving forward from disaster. She wondered what else we can do to support and accelerate what she calls “the comeback journey,” which boiled down to five powerful commonsense practices proven to build resilience like a muscle, enabling us to transform disaster into opportunity and even loss into legacy. She calls those steps The ComeBACK Formula™. Sandra shares The ComeBACK Formula™ with disaster survivors, emergency professionals and other mission-centered leaders as an international speaker, workshop leader and media guest. She has appeared on ABC, CBS, PBS, CBC, Fox, NBC Dateline and numerous podcasts. Currently working to secure sponsors, Sandra would like to print and distribute the ComeBACK Formula™ workbook to all interested survivors of California’s recent fires and mudslides. Her vision is twofold: We have to erase the stigma against our emergency professionals admitting and seeking help in the wake of traumatic work experiences. We have to “make it OK to ask for help.” And we need to add effective, long-term resources for emotional recovery to comprehensive, post-disaster community recovery plans. 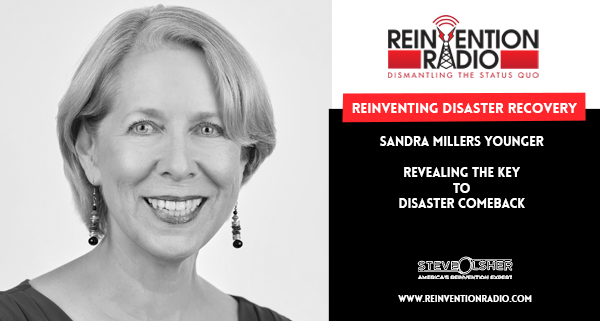 TUNE IN to hear Sandra discuss with Mary and Richard disasters and the key to coming back from disaster . Reinventing Boundaries – In this episode, Michael Levitt discuss with Steve, Mary and Richard boundaries and learning how to stop burning the candle at three ends.